Kuro-sama looks like the wolf which ate Little Red Riding Hood's granny :D Fay is awesome! thank you very much for sharing! Hilarious! Fye is enjoying himself as usual while Kuro is annoyed with him. Great pic of 2 great buddies. Thks a lot! Fai looks great and Kuro-wan wan isn't too pleased tho! Ha ha, Kur and Fay wear dress! Are they prepation agent? Thanks a lots for this scan! that was great! 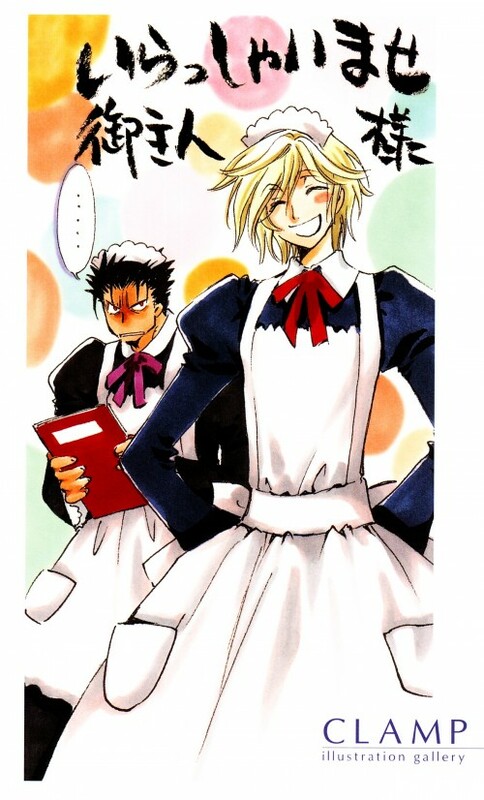 kuro and fye like waitresses >w< cute! Haha so cute. Fai in his little maids outfit.